TechnoFreek's ATOMISWAVE SD Journey: PSU Can't Touch This! Being a Japanese machine, the Atomiswave SD, like most candy cabs operates on 100/110 Volts. 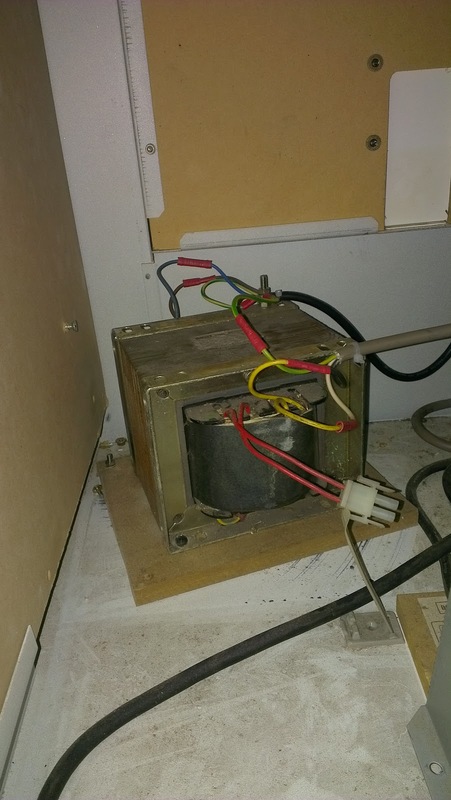 In Ireland 240V is the norm so a step down transformer is required to run the cab. When I bought the cab it came with a transformer already installed and operational. My particular transformer is a big industrial type block. Looks aside, it did the job. Cab powers on. Nothing blows. Simple. 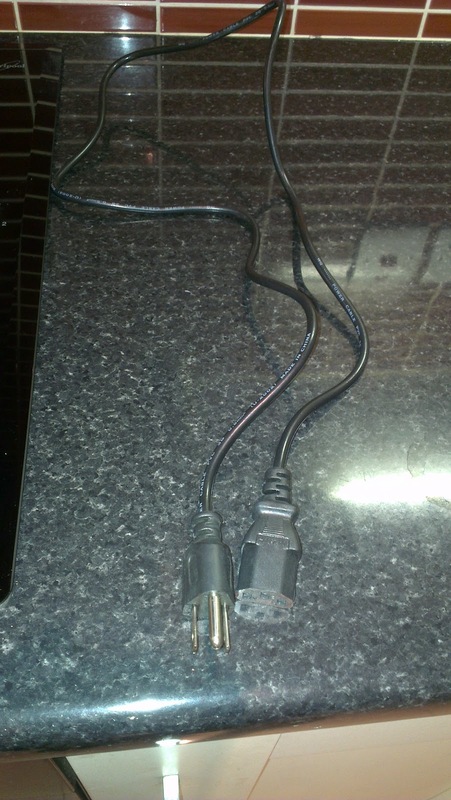 For reference, the picture below shows the 240V supply (black cable) and the stepped down 110v (grey cable). All was not well though. After some attentive gameplay I noticed that the bottom third of the monitor game image was quivering from side to side. Not hugely, but a little distracting all the same. A simple bit of troubleshooting and I found that by positioning the transformer outside of the cab the problem went away. Moving it back inside the cab and the problem returned. Moving it closer to the monitor again exaggerated the issue. Obviously the transformer was causing some interference with the monitor. I'm not techincal enough to explain why but the fact that the transformer wasn't fully shielded can't have helped the matter. 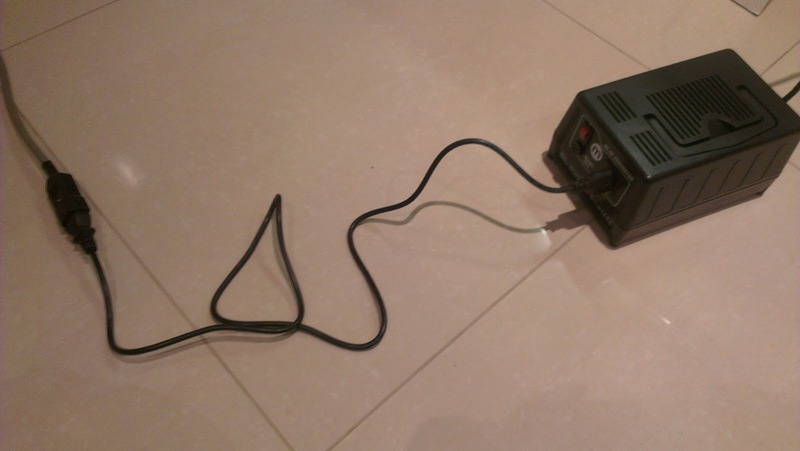 My solution to fix the problem was to buy an external type transformer. These are commonplace in the candy cab community and can be easily picked up from the likes of Maplin. The one I got it is rated at 300W. 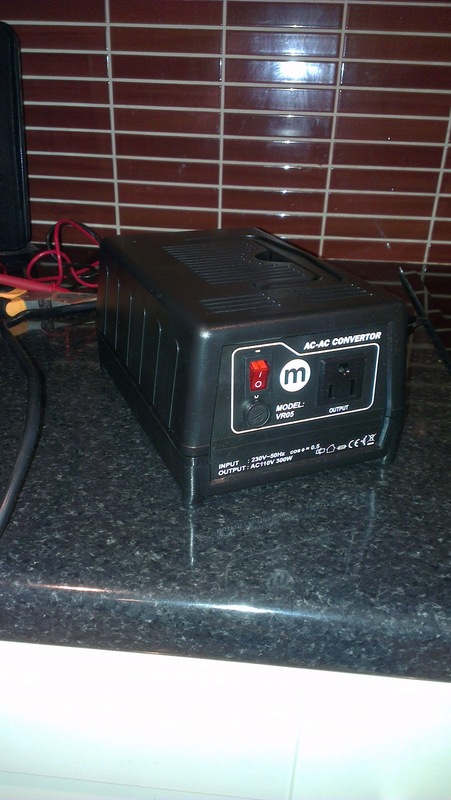 Perfect for my cab which is rated at 140W although you probably wouldn't be connecting two cabs to the one transformer for prolonged simultaneous use. I didn't have a US/Jap 3 pin plug so hit eBay for one. Rather surprisingly rewireable US/Jap 3 pin plugs are tough to source and not cheap. 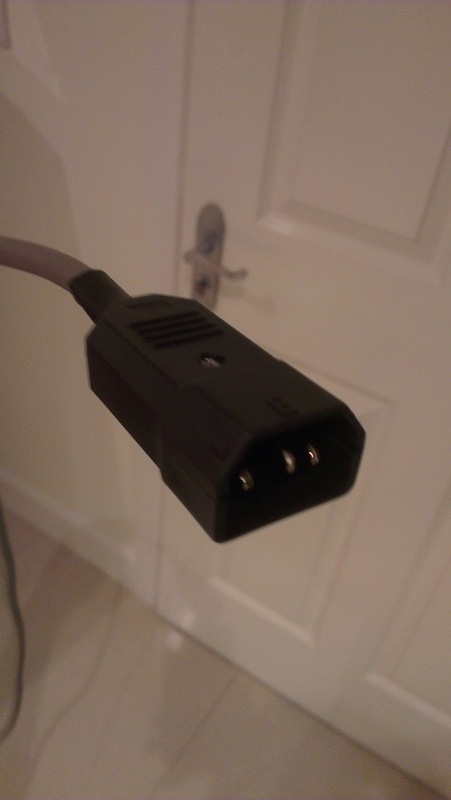 Instead a opted for a US laptop power supply cable. This has a US 3 pin plug on one end and a standard female "kettle lead" style socket on the other end. I also purchased a rather fiddly male "kettle" plug to complete the loop. The correct name for such kettle plugs and sockets is IEC C14. P.S. I know it's convoluted. But it works!